Everyone has a little bit of healer, storyteller, and warrior priest inside. Each of these parts work together to make a WHOLE person. This book is designed to help you meet and integrate all the aspects which make you an amazing individual who makes decisions which are to your own best interests! 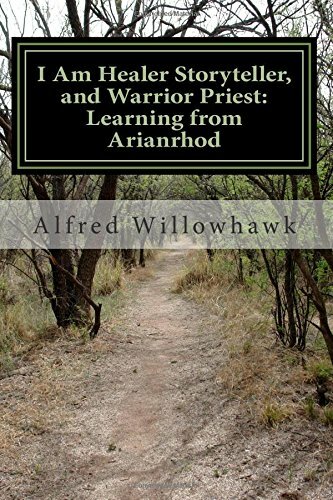 This book traces the myth of Arianrhod as a road map to find the inner healer, storyteller, and warrior priest which is in every person. You can tap this inner strength to have better relationships, make better decisions, and be stronger and more healthy! Arianrhod (ah-ree-AHN-rhohd), Arian meaning ‘silver’, and Rhod meaning ‘wheel’ or ‘disc’. Celtic Moon-Mother Goddess. Called the Silver Wheel that Descends into the Sea. Daughter of the Mother Goddess Don and her consort Beli. She is the ruler of Caer Sidi, the seat of Understanding. The moon is her “seat”, and she comes down in her “silver” chariot to watch over the tides, which her son Dylan rules. She has a special day, December 2, and she is also in some traditions honored on the full moon. She has two sisters, Ceredwin and the Morrigan. In some old religious traditions, she is the Mother, while Cerredwin is the crone, and the Morrigan is the maiden. This is significantly different than the neo-pagan understanding of both Cerridwen and the Morrigan. In some Irish traditions, she is responsible for carrying the dead on her Oar Wheel to Emania (the land of death), and she is the deity of reincarnation and karma. Her consort is Nwyvre (‘nuïv-rə ) ‘Sky, Space, Firmament’, and there is very little information on him. The Druidic information on him is that he is a dragon and a force. It is the force of inner truth, and entomological research shows the word in old Welsh word means “strength and vigor”. As Arianrhod is the Moon and the Mother power, it makes logical sense that her consort would be what would be classified as Young Lord or Rogue energy. Caer Arianrhod is the place to which souls withdraw between incarnations; therefore, she is also the Welsh goddess of reincarnation. The Mother aspect of the Triple Goddess in Wales, her palace was Caer Arianrhod (Aurora Borealis), or the secret center of each individual’s spiritual being, hence Understanding. In all pan-Celtic mythology, the moon is the archetypal female symbol representing the Mother Goddess, connecting womb, death, rebirth, and creation. The pan-Celtic world utilized a lunar calendar rather than the Roman solar calendar, and their priests and priestesses took their observations from the position of the moon and its progress in relation to the stars – the Silver Wheel – or Arianrhod. In the pan-Celtic spirituality structures, the Goddess has three major aspects: the maiden, the mother, and the crone. These three represent the three stages of the life of a woman. Interestingly enough, in neo-pagan traditions, there is a difference in the placement of Arianrhod in the Maiden–Mother–Crone hierarchy. they regard Blodeuwedd (bluh-DIE-weth) which means “flower face”, as a maiden; Arianrhod represents the mother, and the Morrigan, at last, is the crone. So we see that there are regional differences between names, myths, and characteristics of these goddesses. This makes it more difficult to understand what is already a difficult pantheon. For example, in some Irish traditions, the Morrigan is the Morrigan, the battlefield goddess who gave strength to the enemies of the Irish high kings – the Welsh. In another tradition, she is again the battlefield goddess but is there to guide the dead of both sides to the island of the dead. One of Arianrhod’s abilities is to shapeshift into a large owl, and see directly into the darkness and light of the human subconscious. In Welsh tradition, the owl symbolizes death and renewal, wisdom, moon magick, betrayal, and initiations. In addition, the owl flies over the land at night, bringing comfort and healing spread to give solace to those who seek her.